stylish_italian_charms has no other items for sale. Free P&P on orders over AU $9.99 when you buy stylish_italian_charms's other eligible items. 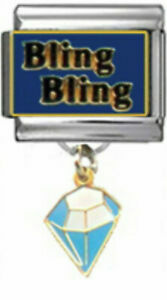 AU $0.00 P&P for each additional eligible item you buy from stylish_italian_charms. YES .. WE DO COMBINE SHIPPING POSTAGE: Please visit our eBay Store Page http://stores.ebay.com.au/Stylish-Italian-Charms/Combined-Postage.html ALL BRAND NEW ITEMS: Stylish Charms is a Registered Australian Business and we ONLY stock and sell BRAND NEW Italian Charms and Italian Charm Accessories to our Worldwide and Australian Customers. PACKAGING: All items are shipped in a PADDED POSTPAK for protection and the COST of the POSTPAK is included in our SHIPPING/POSTAGE charge.